A week ago Sunday, we started the week with 5 pounds of butter in the fridge. Yes, 5 pounds. Most normal people would need to freeze some of that butter in order to not have spoilage issues. Note the words “normal people”. Three days later, there was not a cube of butter to be found in our house. It began with the 8 PM Sunday night ritual of Tried and True Chocolate Chip Cookie making and baking. 1. I always have all of the ingredients. 2. It’s a treat I can throw together in less than 5 minutes, without looking at the recipe. 3. We can have a batch of cookies mixed, baked and cooled in about 30 minutes or less. me- It’s the Toll House recipe. Right on the back of the package. Serious. Okay, a couple of slight changes. So here it is, by popular demand, the ever famous Tried and True Toll House Chocolate Chip Cookie recipe, with modifications, step by step photos and secret recipe hints. Wink, wink. Let me know how they turn out for you. Step 1 – Throw the slightly soft butter into the bowl. Start beating on LOW. 2- Add the sugars, beat some more still on LOW. 3- Eggs, throw them both in, add the vanilla, beat again. Don’t over beat. Are you wondering how many times I can use the word “beat” in this post? 4- It should look like this. Should be smooth, sweet. FYI- rule in cc cookie making – taste it. Now. 5- Throw in all of the dry ingredients (less 1/2 cup of the flour), along with the choc chips. 6- Mix. No beating. More like folding at this point. LOW speed. For 5 seconds, maybe 10. Add the rest of the flour. Look at the bottom of the mixing bowl. Stop mixing when flour disappears. 8- Big scoops are good. 6-8 per pan. 9- Beautiful convection baked cookie. 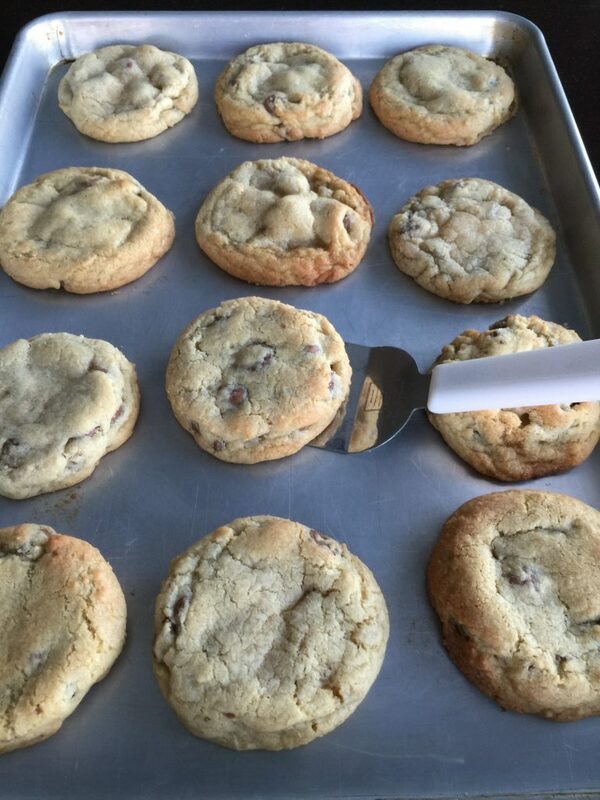 The next cookie was baked using the same batch of dough, same time as the cookie above…. 10- Inferior step sister cookie. aka- cookie baked in standard oven. Sweet on the inside, but not quite as beautiful on the outside. If this post wasn’t quite enough rambling about chocolate chip cookies, check out this post! The last Chocolate Chip Cookie recipe you'll ever need! Make sure to read all of the notes (tips) before making cookies to insure success! Add eggs, beating well. Stir in flour mixture and chocolate chips all together, taking care to not over mix. 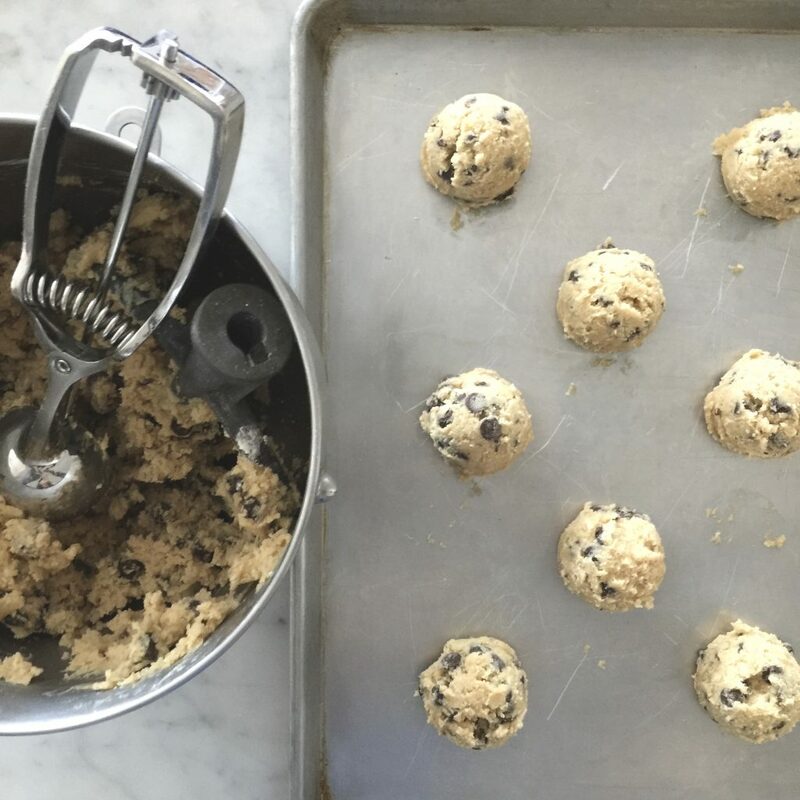 Using a cookie scoop, drop onto ungreased baking sheets. I use a large scoop, and place 6 cookies per baking sheet. Flatten slightly with palm of your hand. Bake for 7-10 minutes on middle rack until golden brown. Cool on baking sheets completely. Updated with more detail, and the amount of flour I always use- 2 3/4 cups. The original recipe said: 2 1/2 to 2 3/4 cups flour . -Only use butter. Unsalted is best. The butter should be more firm than room temperature butter. I take it straight out of the refridge, and microwave it for about 18 seconds ** My microwave is kind of whimpy. Start with about 12 seconds. The butter should not be melty. You should be able to slice the butter easily, or when you push the butter in with your fingers, an indent should be visible, but the butter should not collapse. You can also place the butter out on your kitchen counter for about 30-45 minutes. -*Our altitude is about 4,400 ft. So, I use about 2 3/4 cups flour total. The original recipe calls for 2 1/4 cups. If you are at sea level, you will may need less flour. All purpose flour, do not use cake flour or bread flour for this recipe. I haven't tried wheat flour. I don't think wheat flour really belongs in cookies... DO NOT sift the flour. -Don't over beat the butter sugar mixture, or the batter will become too soft, and your cookies will not be beautiful and puffy. They will resemble pancakes. -There is a notable difference between using a convection and a standard oven (see pics above). 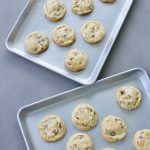 If you bake at the same temperature, for the same amount of time, the convection cookie will be done, with a beautiful, golden, slightly crispy outer layer. Still soft on the inside. And it will be taller than the cookie baked in a standard oven. Not everyone has a convection oven... if you don't, you can still bake a great cookie using a standard oven. -Over mixing. This will cause the batter have too much air incorporated, producing a fluffy, instead of a chewy cookie. -Over baking. Under baking is good! Not under baked to the point the cookie is doughy, but just until the top sets, and the dough looks like it has a bit of a crust and is no longer wet looking on top. -Chocolate chips - For semi sweet, I use Nestle Semi Sweet chips. You can't go wrong here. But for Milk Chocolate, we prefer Guittard. The chips are bigger. I think they are called Maxi Chips. - High Altitude info: Not recommended-directions on Nestle Choc Chip package for high altitude- I have tried this variation, and don't like the result. The cookies aren't quite sweet enough, and have a crispy more cake like texture. Here are the directions on the package: (again I do NOT recommend using this method, but have printed it here as an FYI) Increase flour to 2 1/2 cups. Add 2 teaspoons water with flour and reduce both granulated sugar and brown sugar to 2/3 cup each. Bake drop cookies for 8 to 10 minutes and pan cookie for 17 to 19 minutes. -Last tip! Mound the cookie into a ball. I make them about the size of a golf ball. I use a cookie scoop, because it's easier for me. For years, I just used a spoon, and then shaped them by hand. Make sure to flatten the cookie just a bit before baking with the palm of your hand. I love finding the best recipe of a traditional food like chocolate chip cookies. I tried the NY Times recipe and loved it. I will have to try your also! I made these on Sunday and they were amazing! I accidentally used 1/2 the butter and added a little milk to make it moist and it was still yummy! I'm so glad you posted this because it leads me to my all-time greatest baking dilemma: I am a good cook and a really good baker. No false modesty here, I can handle it. I scour blogs and cookbooks all the time for cc cookie recipes and try them all. Some are good, some lousy, but people always recommend this Nestle original recipe and I've had nothing but HORRIBLE results every time I've made them! 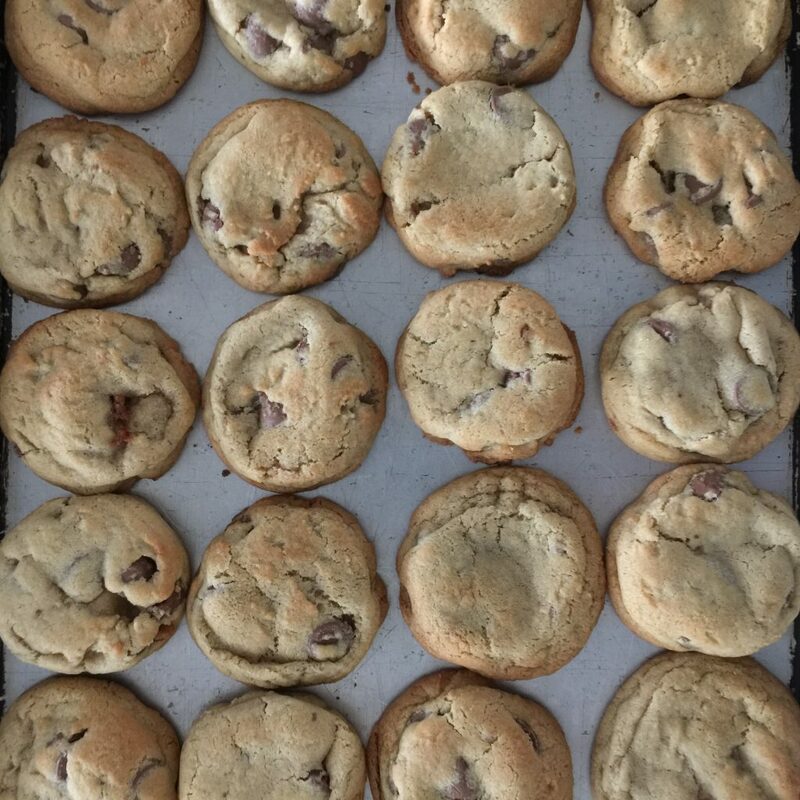 My cookies always come out paper thin, almost see-through, crispy on the edges and doughy in the middles; sort of like a puddle studded with chocolate chips. I've never added more flour for the altitude (I'm in Utah like you) so that could be it, and I have a standard oven. Still, is something else wrong? Could it be my baking sheets? They're the standard insulated ones with ridges and look just like yours in the pics. Also, I use Silpats on each of my sheets instead of parchment. I think I once read that Silpats alter the cookie in some way when you bake, but I didn't think in a bad way. Maybe I'm wrong. I'd love your thoughts, and darn it, I wish I had convection! TTLG: There are specific high altitude adjustments on the package (or online) you may want to try. It calls for adding flour, and reducing the sugars to 1/3 cup each. Also adding a bit of liquid. If you do nothing but add flour, I guarantee you will have better results! Chocolate chip cookies are the best, you can't go wrong. yours look great! Si- I read this and thought of another recipe which is a must must must for CCC. My sister found this recipe and then altered it. They're originally called like $250 Cookies but they're so good we renamed them Million Dollar Cookies. I asked her to email me the recipe so here it is. you must must must try. They are divine. cream together butter and sugars. add eggs and vanilla. mix together with flour, baking soda, baking powder, salt and oatmeal. add grated hershey bars and choc chips. roll into balls, place 2 inches apart on baking sheet. bake 10 min. **can roll balls, place on wax paper to freeze then place in freezer bag. when ready to bake, place in refrigerator to thaw, may need to bake dough for 11 min when dough is refrigerated. mmmmmmmm those do look oh so wonderful! 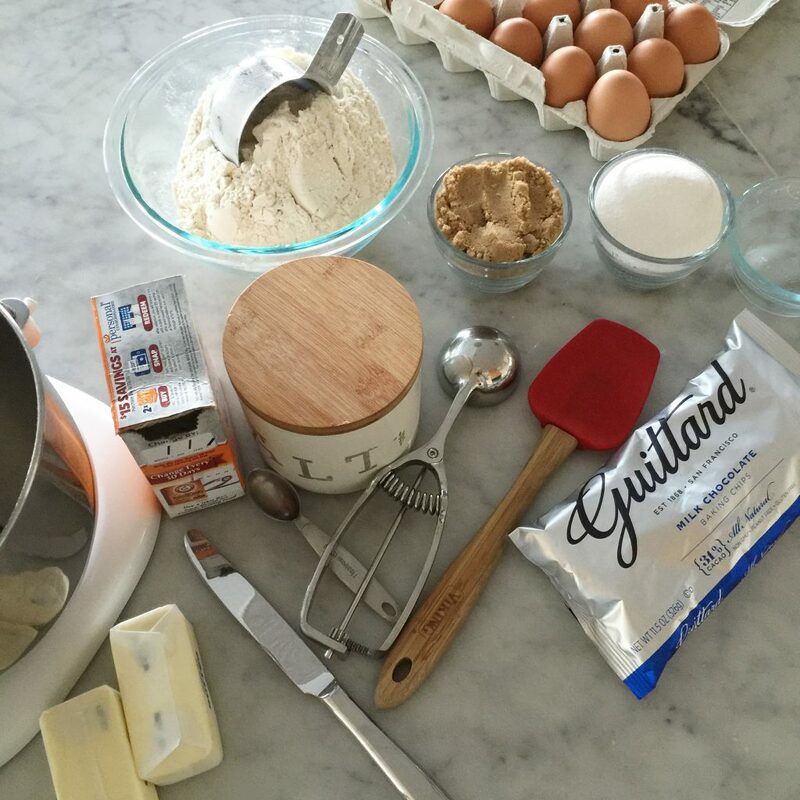 Lis, I have this recipe – the famous Neiman Marcus cookie recipe. I like your modified name. They are yummy. Haven't made them in years. Thanks for the reminder! I now know why after 25 years moving from no altitude (Ohio, Indiana, CA) to Utah, why my cookies aren't "picture perfect". No convection oven. I'm going with that explanation for not baking. LOVED your post about the cookies, my friend. Loved. Can't wait to bake now. . .
2. Sea salt sprinkled on top. 3. Chocolate discs rather than chips, as it gives it a 'ribbon of chocolate' effect. I'm sure that I'll try your recipe soon. It looks so mmmmmm…..
Me again. Just wanted to let you know I received a few of the cookies Barb mentioned above – special delivery hot from her oven! They were really delish. Here's my review: If you want to make a special cookie, yes, these are wonderful. A little on the salty side. I like salt, and love the chocolate salt combo, but my guess is they are a little salty (11/2 tsp in the batter plus baking soda, and more sea salt on top) for the average cookie lover's taste buds. Last week, I made tried and true cc cookies for a group and someone comment on the too salty flavor of my recipe, this recipe would have put them over the edge. In comparison, when looking at the recipe, bread flour, cake flour, special chocolate, chilling, all of the steps are, in my opinion more fuss than I am willing to take to make cc cookies. Also 18-20 minutes at 350? hmmm-seems a little long. That said, if you really love cc cookies, and are a patient person, you should give the NY Times recipe a try. My fave part about the NYT recipe was the larger chocolate "chips" or "ribbon of chocolate" effect. Let us know what you think! Thanks Miss Barb. Do you really use 1 Tablespoon vanilla? Or is that a misprint? Thanks! I really use one tablespoon of vanilla! I usually bake these at 350-375 convection! Am I crazy or does the recipe not list the baking temperature? Making for the second time! Honestly after repeatedly trying chocolate chip cookie recipes for years, this is definitely a keeper. My family and I thank you – no waiting on refrigeration and wonderful flavor and texture. Thanks Maria! So glad you love this. It’s our favorite! Hi – making these for the third time! So, so, so good. I was in the beautiful state of Utah but didn’t get to try the swig cookies, so I’ll have to try your recipes! I’m sure they are just as good or better than what I could have found there. LOVE this recipe. Have made it over a dozen times. I usually fold the dry ingredients and chocolate chips in with a rubber spatula rather than kitchenaid, just to evenly fold. Thanks so much! I often fold the last ingredients as well. I’m about to update this recipe with that suggestion! I made these with gluten free flour today, and they are perrrrfect👌🏼 And no, I have not forgotten what a real deal cc cookie tastes like haha. I know a good cc cookie when I taste it, and this is the best I’ve tried, gluten free or not! The NOT over beating or baking. The convection…it all makes such a difference! Do you think I could use m&m’s instead of chocolate chips? Its a polka dot themed birthday party?